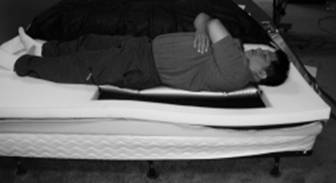 Strobel's Patented Air-Lever option has many advantages over regular airbeds. 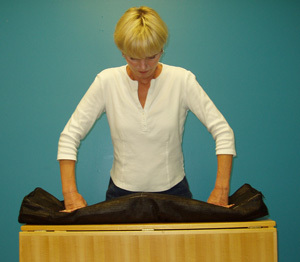 With regular airbeds a hammock effect is created because the body sinks into the bed and air displaces mostly under the legs and to the sides of the body. With Strobel's, the torso length of the tubes concentrates the air displacement to the lumbar area, and the tube design prevents displacement to the sides focusing support to the back. The Lever-Spring system is on top of the tubes and air displacement enhances the Lever action. Also the Lever-Springs balance the action of several tubes. In addition Strobel's design has no pumps, motors, or valves nothing to go wrong! Strobel's air tubes are foam filled and factory sealed. 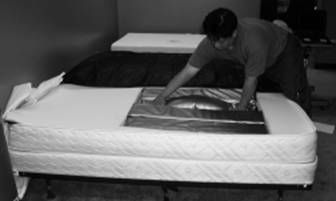 Even if an air tube someday fails, the bed does not become unusable due to the foam filling. Proper spinal alignment in any sleeping position, Strobel's Patented system gives you the best back support.